Thomas A. Twomey, Jr. was the founder of the largest law firm on the East End of Long Island. 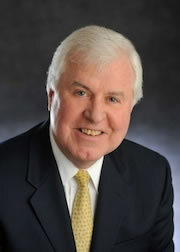 Tom established the law firm in Riverhead in 1973. A list of some of Tom’s achievements follow. Tom divided the early years of his legal career between building his private practice, acting as counsel to local municipal boards and spear-heading numerous local, County and Statewide public interest efforts. Tom organized a civic organization, Halt The Highway, and led the fight to prevent the proposed extension of the Sunrise Highway from Shinnecock Hills to Amagansett. In 1975, working with County Legislator Joyce Burland and other local activists, Tom convinced the Suffolk County Legislature to pass the landmark Farmland Preservation Program. In later years, as the Chairman of Governor Cuomo’s East End Economic and Environmental Institute, Tom was instrumental in extending farmland preservation through all of New York State with the passage of the New York State Farmland Preservation Program. His other accomplishments on that Commission included increased State support for the local tourist and wine industries as well as the recreational needs of the East End. In 1977, Tom was retained by a group of local farmers to oppose the Long Island Lighting Company’s proposal to build four nuclear power plants in Jamesport, on the North Fork. Tom built a broad, Statewide coalition of environmental, civic and political groups in opposition to the Jamesport plants and ultimately to the Shoreham Nuclear Power Plant, all of which were defeated. Tom’s leadership role in East Hampton’s 350th Anniversary Celebration resulted in his being named Town Historian. In that capacity, he edited five volumes on the history of East Hampton, all of which were published through private donations. Tom was a leading supporter of many East Hampton charitable and public institutions. He served numerous terms as the President of the East Hampton Library. In 1997, as Chair of the Library’s Capital Campaign Committee, he helped raise $3.6 million to renovate and restore the Library. Tom chairedthe Library’s Capital Campaign to construct a Children’s wing at the East Hampton Library, which was successfully completed in 2014. Tom served on the Executive Committee of the Guild Hall Cultural Center and was actively involved in raising funds each year for Guild Hall’s annual operating budget. In collaboration with Tom Clavin, Tom wrote a full-length screenplay about the pirate, Captain Kidd, which garnered two prestigious screenwriting awards.